Market Rasen Town's Development Squad. 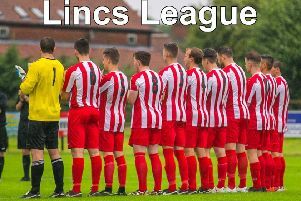 Market Rasen’s Development Squad got their first win of the campaign at the weekend, a 2-1 victory at Rase Park against Burgh le Marsh in Division Three of the East Lincs Combination League. Daniel Clark opened the scoring and George Bennett headed the winner. Pictured are the squad with manager Paul Sellars, who have a new sponsor - Steve Barnes of GB Directional Drilling Services Ltd. There was a hat-trick for Tom Carter for the under 16s, along with goals for Jack Richards, Robbie Gouldsbra and Jack Kavanaugh, earning them a 6-0 win against Heckington. The under 15s were unfortunate to start their season against a very strong Grantham side, missing out 11-0 in their first-ever game together. The under 13s started their season with a great performance, winning 4-1 against Horncastle Town. Goals came from Obie Casson, Chris Allen, Alex Aistrop and Henry James.